Texas A&M University-Kingsville was the site of the state-wide High-Impact Practices in Higher Education Conference held on campus Friday, March 31. The conference was sponsored by Texas A&M-Kingsville’s Title V I-CARE (Integrating a Culture of Academic and Research Engagement), the Center for Student Success and the Center for Teaching Effectiveness. Participants came from 14 universities in Texas and Oklahoma with a record number of attendees at 146 for the fifth year of the conference. 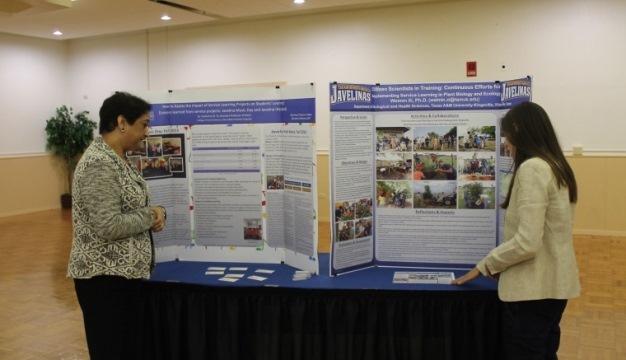 The conference day began with 18 faculty members showcasing their award-winning service learning projects at a poster exhibit. Conference attendees had the opportunity to view each of the faculty posters and interact with the faculty members about their service learning projects. A service learning panel with eight faculty members from different disciplines discussed the success and challenges of implementing service learning high-impact instructional practices. They offered suggestions for creating experiential opportunities for students to become involved with and reflect on issues in their communities. Dr. Steven J. Corbett, director of the Texas A&M-Kingsville Writing Center and Dr. Patricia Huskin, assistant professor in the teacher and bilingual education department, presented an interactive session entitled Engaging Ideas and Strategies for Student Writing Success. This session demonstrated ideas and strategies instructors can employ to increase student writing success in courses that focus on writing as a student learning outcome. Several ideas for high engagement strategies were discussed and demonstrated including active learning as well as peer review and response. These strategies support students in achieving success in writing intensive courses and improve the overall writing skills of students. The highlight of the conference was guest presenter Dr. George D. Kuh, director of the National Institute for Learning Outcomes Assessment; Chancellor’s Professor of Higher Education Emeritus at Indiana University; and Adjunct Research Professor at the University of Illinois. Kuh’s keynote address What Matters to Student Success: The Promise of High-Impact Practices discussed creating the conditions that foster success in postsecondary education. He proposed that much progress has been made during the past two decades in using active, collaborative and problem-based learning, learning communities, theme-based residences, service learning, intrusive advising, internships, and other educationally purposeful programs and practices to enrich student learning and promote educational attainment. He said that despite all this activity, too often, these and other effective educational practices are underutilized. This session addressed the topic of what matters to student success, examined some key indicators of quality such as student engagement, and illustrated the kinds of policies and high-impact practices that channel student institutional effort toward educationally purposeful activities which often boost the performance of historically underrepresented students. His workshop Diving Deeper in High-Impact Practices provided an interactive session that built on his keynote address by delving deeper into the components of high-quality, high-impact practices, as well as other programs and activities frequently found on college campuses that have the potential to have the effect of a high-impact practice if intentionally modified. Participants were able to identify currently existing high-impact practices at their campuses and discuss what it takes to ensure that these practices are of a high quality and how to scale them so that every student has at least one such experience before graduating. The conference concluded with a faculty panel from Texas A&M-Kingsville who had been awarded a stipend from the Title V I-CARE grant to redesign their courses to include a classroom-based undergraduate research component that had not previously existed in the course content. The faculty panel discussed their implemented research projects and experiences in the classroom. Each panelist presented a short summary of their research project, shared their student perceptions of the project and discussed their approach to assessing the projects, project sustainability and future changes and/or improvements to the current undergraduate research design. Following the faculty panel discussion, the Title V I-CARE grant staff provided an overview of the current undergraduate course redesign competition for faculty that have questions prior to submitting their proposals. In additional to the undergraduate research component of the Title V grant, national scholarship opportunities were discussed as well as the concept of helping students to develop their personal statements.